Activist group Restore the Fourth Utah adopts highway to NSA data center. An anti-NSA group has found a clever way to protest the agency’s “secret” Utah spy center. Out in the Utah desert, the National Security Agency has been building what’s been billed as the country’s biggest spy center: a massive data-collection facility designed to intercept and analyze electronic communications from around the world. But the shadowy, $1.7-billion facility may turn out to be a little less shadowy than the agency had hoped. As Forbes’ Kashmir Hill and others have reported, the NSA has been vigilant about keeping the public away from the data center. When Hill stopped by unannounced in March and snapped some photos, she was detained and interrogated for an hour before eventually agreeing to delete two of the pictures. But a plucky band of activists has found a clever loophole. According to the Salt Lake Tribune, an anti-NSA group has “adopted” the two-mile section of highway that runs past the “secret” facility. And don’t think they did it just because they want to keep the road litter-free. The group, called Restore the Fourth-Utah—as in, restore the Fourth Amendment, the one that protects citizens against unreasonable search and seizure—told the Tribune its members plan to carry picket signs while they pick up the trash. 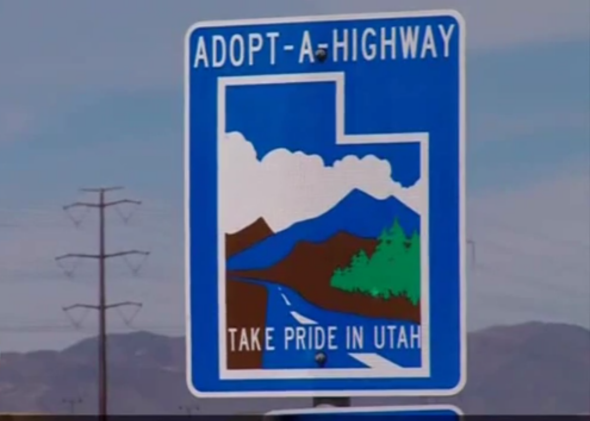 They’ll also get an official “Adopt-a-Highway” sign bearing the group’s name along each side of the freeway. This is not the first setback for the data center. According to the Wall Street Journal, a series of electrical surges has damaged hundreds of thousands of dollars worth of equipment and delayed the facility’s opening by a year. Utah also surprised the agency with a proposed energy-rate hike in May, which could cost the power-hungry facility some $2.4 million per year.